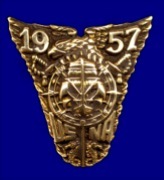 Purpose: The purpose of the Stewardship Committee (The Committee) is to act on behalf of the Class of 1957 (The Class) in such manner as needed to keep the class abreast of the status and workings of the USNA Class of 1957 Chair in Naval Heritage (The Chair) pursuant to the Memorandum of Agreement (MOA) between the Class and the USNA Department of History (the Department). The Committee shall also exercise fiduciary responsibilities as needed to assure that Chair Funds are expended in such a manner as to assure viability of the Chair for its anticipated duration of a minimum of twenty-years. Composition: The Committee shall be comprised of a Chairman and up to nine members of the Class appointed by the Class President. They shall serve at the pleasure of the Class President. Members shall include former USN, USMC and USAF officers. The Committee Chairman shall act as recorder and be the principal liaison between the Committee, the Department, and the incumbent of the Chair. 1. Status of Chair Funds (in hand and pledged). 2. Status of incumbent or prospective hire for the chair to include anticipated end of tenure of current incumbent and timing of anticipated new hire. 3. Review curriculum vitae of prospective candidates as provided by the Department. 4. Review of events and activities carried out by the incumbent of the Chair during the current academic year. These might include, for example, special lectures or symposia held or proposed/planned; research undertaken by Midshipmen under the guidance of the Chair incumbent; involvement in Plebe Summer Indoctrination and its Parent's Weekend; involvement with upper class Parents Weekends. 5.Opportunities for classmates to participate in activities that highlight or feature the Chair. Reports:The Committee Chairman shall prepare a report of Committee activities and provide it to the Class President for inclusion in the Class Newsletter and to the Class Corresponding Secretary for inclusion in the Class column in Shipmate. Also, the Chairman will provide timely information to the class on planned activities of the Chair . "YESTERDAY'S LESSONS FOR TOMORROW'S SECURITY"
The primary purpose of the Class of 1957 Chair in Naval Heritage is to foster in the midshipmen the importance of an understanding of naval heritage to their profession. From its very establishment, the United States has relied upon sea power to defend itself and its world wide interests. The naval leadership that carried out this enduring mission is replete with lessons for today's midshipmen. Similarly, sea power through the ages provides a foundation for studies in sacrifice, courage, fortitude and leadership. Because the United States remains an "island nation" the importance of the naval service is as significant now as it was in the age of Mahan. The Class of 1957 Chair in Naval Heritage will contribute to the academic stature of the Naval Academy in general and the History Department in particular. Additionally, it will foster scholarship in the world's rich naval history. The Chair in Naval Heritage will contribute to the Naval Academy in myriad ways; teaching the significance of the naval service now and across the years; working to enhance the study of naval heritage via ongoing initiatives at the Museum in Preble Hall, at the U.S. Naval Institute, and the Naval Historical Foundation; and assisting in the creation of symposia dedicated to the study of naval issues throughout history. The Chair has the very real potential to be a focal point for core values at the Naval Academy. Successive appointments will be made to the Class of 1957 Chair in Naval Heritage. 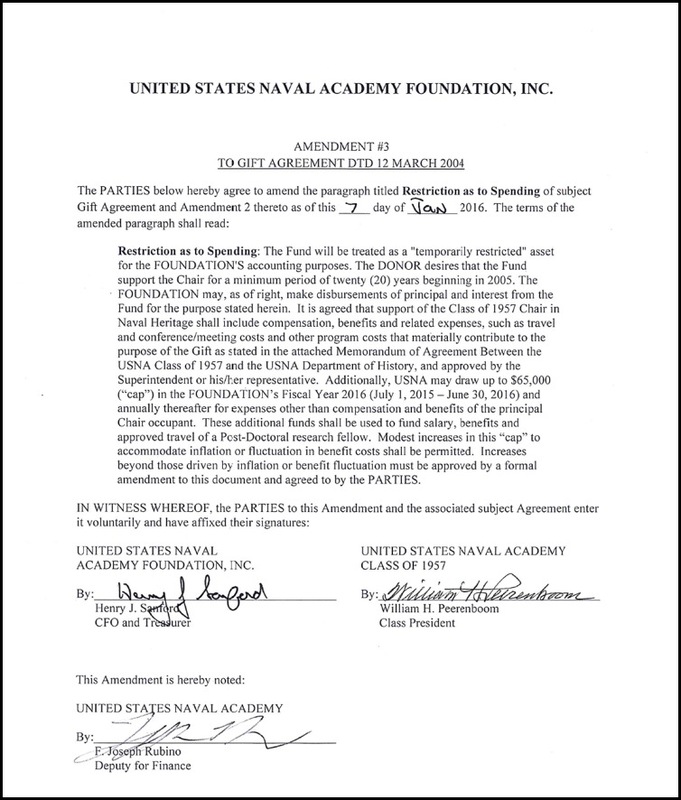 The intent is to bring to the Naval Academy accomplished and nationally-renowned historians with experience in teaching and notable publication records.\par The Department of History Chair will apprise the President of the Class of 1957 on a regular basis as to the status and workings of the Chair in Naval Heritage. Further, the Department will work with the Chair in Naval Heritage and the Class of 1957 to ensure a meaningful relationship is maintained.